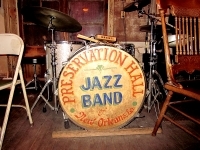 Historic Preservation Hall is New Orleans' most popular jazz venue, where Preservation Hall jazz bands serve up first-rate Dixieland Jazz every night in the French Quarter building, originally built as a residence in 1750. There are three performances a night, each lasting about 45 minutes. No seating, food or drinks are available, but crowds of all ages flock here simply for the wonderful music. It's possible to get tickets at the door without booking in advance, but it's advisable to arrive about 30 minutes before the show to avoid long queues or disappointment when tickets sell out. Opening times: Nightly showtimes are 8pm, 9pm and 10pm. Admission: Tickets cost between $15 and $20 at the door.